*shrug* I may have had my fill of Hitman in that case. I guess we'll see. I finished the Busey mission and the bonus Sapienza mission. I finished it really quickly, which left me feeling a bit disappointed. I started in the safe house and picked up the explosive golf ball out of habit. I was walking around the alleys since that's where he was in the intro video. After a minute, he just walked around the corner. I dropped the golf ball at his feet. It blew up and I casually walked away in the confusion. I feel like I probably missed some dialog (I didn't even see Cole at all), but I couldn't really pass up that chance. I really liked this mission. While I know the space really well after getting to mastery 20 in the main mission, the movie set really changed things to the point where it felt like a whole new level. I ended up pursuing one opportunity (changing the robot's grip strength) and then dropping it when a cooler one presented itself (the pyrotechnics). I had a hard time getting a SFX crew disguise, but once I did, it was pretty easy to set it up. I'll have to go back and explore the other options. I like the idea of having a bulletproof target since sniping would sort of make the level trivial. Yeah, Busey was disappointingly straightforward. 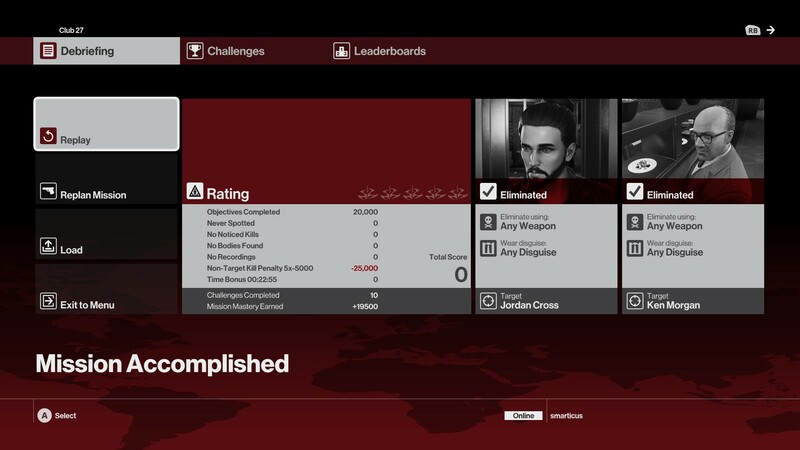 As much as I love the Sapienza area I think they need to stop doing elusive target missions there unless they put a lot of interesting rules in place because otherwise most of the time these missions are going to be a little too easy. I actually held off from killing him for awhile just so I could follow him around and listen to some bantz. I didn't even see Gary Cole. The nighttime missions are really cool though, I am enjoying those a lot! I really wish I could get the soundtrack for this game, its not Jesper Kyd genius, but its got quite a few cool tracks. Gonna have to wait until all the levels are out, and the disc version is released I bet. You have to kill a guy and steal a thing. Exciting! ...use a screwdriver to mess with the power strip in the puddle, but forget to turn it off first? Because I did, and I felt like a complete idiot. Ahah. Last time in Paris I used the unsilenced sniper and was gunned down in a couple of seconds. I started from the attic. It was pretty stressful to start having to hide from armed people. I scoured through the building before I found the safe, had a small comedy of errors in dealing with the nearby guards, stole the egg, took one of the butler disguises (he said I was possessed by the devil for some reason), spent ages looking around for the target and again dropped a duck a few feet before him. I love the red ducks. I was focused on trying to steal the egg first since that seemed like the more difficult of the two goals. There's an extra guard in the room compared to normal. I tested out using the radio in the bathroom, and only one of the guards came in when I tested this out, but when I tried to do it for real I choked the guy out and then the other guard came running in and took me out before I had a chance to respond. Go figure. The radio is tough. For me it used to bug out by alerting everyone as soon as I had it selected. I never use it, I try to find faucets and such. Killed The Broker. Got the Sheik disquise. Standing right next to the safe with the key in my hand, waiting for the guard to turn around. GPU crash. I was worried about that the whole time. I get those often in dx12 mode. "Of course, our plan is to have three seasons. Although Season Two hasn't been confirmed yet." The Thailand mission is out! Did that sneak up on anyone else? I just finished my first time through. Nailed it. Meh, still feeling disappointed and a bit robbed about the bonus missions. Don't think I'll be buying anymore, but strangely also don't want to have them spoiled in case a sale comes up or something, so I guess it'll be the end of me watching the coverage too. I only started it. Seems sweet though. Yeah, the bonus mission stuff, and the fact that there's no easy upgrade path for someone who bought the starter pack and an episode and wants to get everything, is not great. I usually avoid season passes, but I didn't in this case. I bought in after hearing the Thumbs talk about Sapienza. I figured that if the first two levels were as good as they said, the season pass would probably be worth it. I haven't regretted it yet, but that doesn't help anyone who tried to buy it episode by episode. After I bought and liked the first episode, I made the conscious decision to buy each episode as it came to speak with my money and prove that I could stay interested each month, as well as give the developers a little extra change since I wasn't getting the package discount. So that makes me extra sad that I made the move I thought would help, and then got punished for it. Cool mission, I like hotel levels reminds me a little of the one from Blood Money. There seems to be no new music in this mission its all just taken from the Paris mission - apart for the specific music like the cat walk or bar area. If it makes you feel any better, I was pretty underwhelmed by the bonus missions. Same. The Sapeinza bonus mission was kind of neat, but I didn't feel the need to replay it like I have with all the main missions. I also didn't ever get around to finishing the Marakesh bonus mission at all because it didn't seem very interesting. Yeah the bonus missions were very underwhelming, not a whole lot to do in them. I never actually beat Marrakesh, just didn't get into that level at all. The latest one is very good though, I've spent an hour or so on it, haven't beaten it yet. I'm still in my scoping out phase, lots of ways to get around, lots of disguises to use, lots of Intel to find. Pretty much all the things I thought were lacking in Marrakesh. Just finished the Thailand episode. I know its a core part of the game, but, man, I hate changing out of 47's suit. You could go for the suit only challenges... I've never done it, though, sounds tough. I played an hour or so yesterday, just being a crazy murder guy. The new level feels really, really good. I'm sick today, so more Hitman for me. Poison everyone in the atrium, run in and snap the singer's neck then dress up as one of his security, head over to the restaurant the other guy is at and throw a letter opener at him then run around the corner to punch out a waiter and steal his clothes then escape on the boat. Looking forward to trying other solutions now that I have some alternative starting points to use.